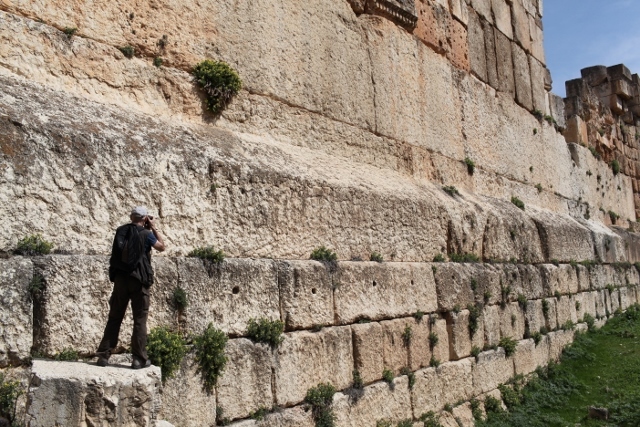 The largest blocks used in any known man-made structure are found in the cyclopean U-shaped wall around the foundation platform of the Roman Temple of Jupiter at Baalbek in Lebanon.8 In the western wall, at a height of 10 metres, there are three colossal limestone blocks known as the Trilithon, measuring 19.1, 19.3 and 19.6 metres long, 4.34 metres high and 3.65 metres deep, and weighing around 800 tonnes each. The stones fit together perfectly and not even a knife blade can be pushed between them. 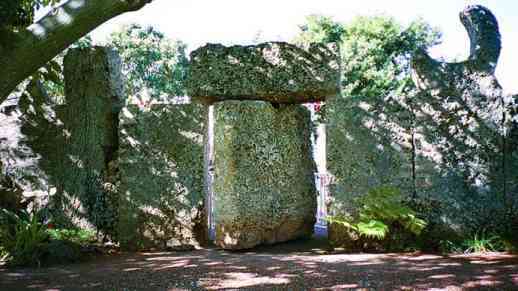 The course of stones beneath the Trilithon contains seven mammoth stones weighing about 450 tonnes each. Fig. 5.2 Other views of the Trilithon. At the quarry, about a kilometre away, there are three monoliths even larger than those in the Trilithon.10 One of them, known as the ‘Stone of the Pregnant Woman’ or ‘Stone of the South’, weighs about 1000 tonnes; the lower part of its base is still attached to the bedrock. Another weighs 1240 tonnes, while the largest one measures around 19.6 by 6 by 5.5 metres and weighs an estimated 1650 tonnes. It was discovered in 2014, and lies next to the ‘Stone of the South’ but at a lower level. 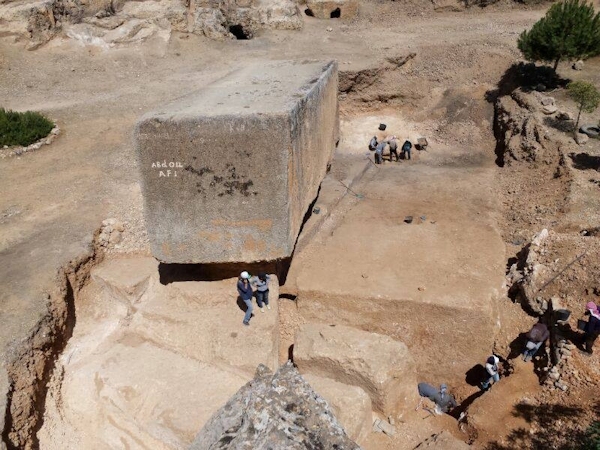 It is the biggest known ancient cut stone on the planet. There are no traces of a roadbed leading from the quarry and no traces of any ramp. Nor are there any written records as to how the megalithic wall was built. 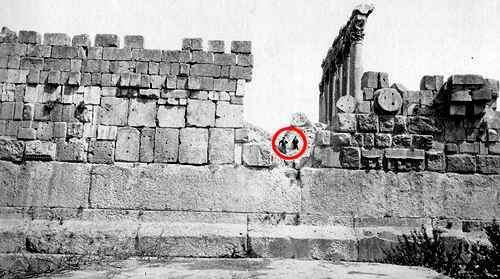 According to local Arab legend, Baalbek’s first citadel was built before the Flood, and rebuilt afterwards by a race of giants. The Phoenician historian Sanchuniathon stated that Lebanon’s first city was Byblos, founded by the god Ouranus, who designed cyclopean structures and was able to make stones move as if they had a life of their own. Evidence that worldwide legends of acoustic levitation might have a basis in fact was provided by the Swedish engineer Henry Kjellson, who in the 1950s recorded the experiences of two separate western travellers who had allegedly witnessed demonstrations of sonic technology in Tibet.1 Since neither of the following accounts can be verified, sceptics assume that Kjellson probably made them up himself. During a visit to a Tibetan monastery situated southwest of the capital Lhasa, the Swede Dr Jarl was taken to a meadow where there was a high cliff to the northwest. About 250 metres up the face of the cliff was an entrance to a cave, in front of which was a wide ledge where monks were building a stone wall. Embedded in the ground 250 metres from the foot of the cliff, was a large rock slab with a bowl-shaped depression in it. A block of stone, 1.5 metres long, 1 metre wide and 1 metre high, was manhandled into the depression. Monks with 19 musical instruments, consisting of 13 drums and 6 very long trumpets, were arranged in an arc of about 90 degrees, 63 metres from the bowl-stone. The drums, open at one end, were aimed at the stone block. Behind each instrument was a line of monks eight to ten deep. A monk in the middle of the arc started chanting and beating out a rhythm on a small drum, and then the other instruments joined in. After four minutes, the large stone block began to wobble and floated into the air rocking from side to side. All the instruments were trained constantly on the stone as it rose upwards at an accelerating rate and finally crashed onto the ledge. The monks continued to perform this feat at the rate of 5 or 6 stones per hour. The role of the 200 or so monks behind the instruments was unclear: one suggestion is that they used some form of coordinated psychokinesis to aid the flight of the stone. Fig. 5.4 Dr Jarl’s sketch showing how Tibetan monks were able to raise stone blocks into the air using the power of sound. The second case involved an Austrian named Linauer, who stated that while at a remote monastery in northern Tibet during the 1930s, he had witnessed the demonstration of two curious sound instruments which could induce weightlessness in stone blocks. The first was an extremely large gong, 3.5 metres in diameter, composed of a central circular area of very soft gold, followed by a ring of pure iron, and finally a ring of extremely hard brass. When struck, it produced an extremely low dumph which ceased almost immediately. The second instrument was also composed of three different metals; it had a half-oval shape like a mussel shell, and measured 2 metres long and 1 metre wide, with strings stretched longitudinally over its hollow surface. Linauer was told that it emitted an inaudible resonance wave when the gong was struck. The two devices were used in conjunction with a pair of large screens, positioned so as to form a triangular configuration with them. When the gong was struck with a large club to produce a series of brief, low-frequency sounds, a monk was able to lift a heavy stone block with just one hand. Linauer was informed that this was how their ancestors had built protective walls around Tibet, and that such devices could also disintegrate physical matter. Keely built several devices to manipulate gravity.2 One of them was the ‘sympathetic transmitter’, a copper globe about one foot (30 cm) in diameter, containing a Chladni plate and various metal tubes, whose position could be adjusted by means of a knob. The globe was held by a metal stand, around the base of which projected small metal rods a few inches long, of different sizes and lengths, which vibrated like tuning forks when twanged by the fingers. In one experiment, the transmitter was connected by a wire made of gold, platinum and silver to the top of a water-filled glass jar. When the right chord was sounded on the strings of a zither, metal balls, weighing 2 pounds (0.9 kg), rose from the bottom of the jar until they hit the metal cap, and remained there until a different note was played, which caused them to sink again. Witnesses relate how, after further experimentation, Keely was able to make heavy steel balls move in the air by simply playing on a kind of mouth organ. 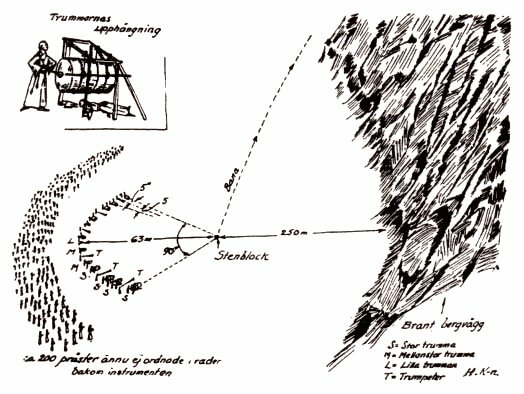 Using the same combination of transmitter, connecting cord and musical instrument, he was able to make a 3.6-kg model of an airship rise into the air, descend, or hover with a motion ‘as gentle as that of thistledown’. He was also able to lift extremely heavy weights by connecting them to vibratory appliances worn on his person; several people witnessed him levitate and move a 3-tonne cast-iron sphere in this way, and also make it heavier so that it sank into the ground as if into mud. Keely was able to catalyze the vibratory force necessary to make objects move using a variety of musical instruments, including trumpets, horns, harmonicas, fiddles and zithers, and could even operate the equipment just by whistling. 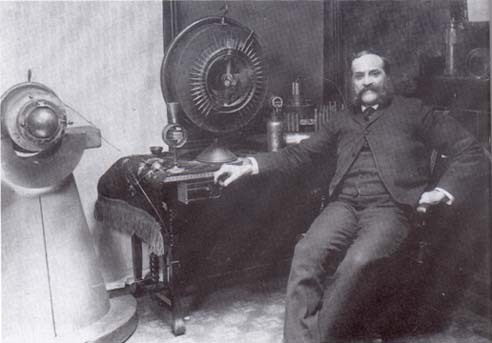 One sceptic, however, claimed that Keely did not play on an instrument to set up sympathetic vibration but to signal to a confederate in another part of the building when to turn on or off the compressed air that supposedly powered his ‘fraudulent’ devices! A man who in more recent times claimed to know the secret of how the pyramids and other megalithic structures were built was Edward Leedskalnin.3 He lived in a place called Coral Castle, near Miami, Florida, which he built himself from giant blocks of coral weighing up to 30 tons. In 28 years, working alone, without the use of modern construction machinery, he quarried and erected a total of 1100 tons. He was very secretive and usually worked at night, and died in 1952 without divulging his construction techniques, despite visits from engineers and government officials. Some teenagers spying on him one evening claimed they saw him ‘float coral blocks through the air like hydrogen balloons’. Some people think that he had discovered a way of locally reversing the effects of gravity. From the remaining contents of Leedskalnin’s workshop and photographic evidence, engineer Chris Dunn suggested that he generated a radio signal that caused the coral to vibrate at its resonant frequency, and then used an electromagnetic field to flip the magnetic poles of the atoms so that they were repulsed by the earth’s magnetic field. According to aeronautical experts, the flight of the simple bumble bee is a mystery that defies conventional laws of physics, as its wings do not flutter rapidly enough to create sufficient lift. The rhinoceros beetle should also be unable to fly as its body mass is completely out of proportion to its wing area. Some writers have suggested that levitational forces help to explain how birds and insects fly, and fishes swim. Austrian scientist and inventor Viktor Schauberger (1885-1958) believed that, alongside gravity, a principle of levity operated in nature, governing all upward movement of energy, all uplift and upward growth. During his early life as a forester in the Alpine wilderness, he observed how large mountain trout could lie motionless in the strongest currents, except for an occasional slight movement of their tail-fins. If alarmed, they darted at lightning speed upstream, instead of allowing the current to carry them downstream. Trout and salmon are able to jump up high waterfalls (even as much as 60 m high) with little apparent effort. Schauberger would watch trout dance in a wild spinning movement at the bottom of a waterfall, and then come out of this spinning movement and float motionlessly upwards. He developed the idea that in addition to the gravitational movement of water from the spring down to the sea, there is a flow of ‘levitational’ energy in the opposite direction. In one experiment Schauberger had 100 litres of hot water poured into a stream. Although it did not noticeably warm the water, a trout resting about 150 m downstream immediately became very agitated: it started to flail its tail, moving backwards all the time as it struggled to maintain its position. Finally it was swept downstream, and only returned much later. Schauberger concluded that the hot water had destroyed the upward flow of levitational energy. One moonlit winter night, he saw egg-shaped stones the size of a head rise to the surface of a deep pool, and concluded that the combined effect of the cold and the metalliferous composition of the stones (especially their silica content) was responsible for enhancing the levitational energies. Schauberger was surprised to find that the tips of mosses on rocks in a shaded mountain stream point upstream, somehow resisting the pressure of the fast-flowing current. He regarded this as a reliable indicator of a stream’s state of health, because it showed that the downstream gravitational flow of matter and the upstream, levitational flow of energy were in balance. However, if through deforestation a stream is exposed to direct sunlight, the water becomes warmer and less dense, and the moss-tips point downstream. Pristine wilderness is nowadays hard to find, owing to the marauding hand of man. Schauberger sought to develop energy-generating machines which, by the power of shape, form and motion alone, were able to mimic nature’s processes. Whereas today’s main energy technologies use outward-moving explosion, such as fuel-burning and atom-splitting, his machines operated on the basis of inward-spiralling movements, or implosion. He wrote: ‘If water or air is rotated into a twisting form of oscillation known as “colloidal”, a buildup of energy results, which with immense power, can cause levitation.’ Vortical motion, with rotational velocities of 15-20,000 revolutions per minute, accompanied by rapid cooling, created strong vacuum effects inside his machines. Some researchers think that the transmutation of matter into more ethereal states and the production of genuine levitational forces also occurred. Fig. 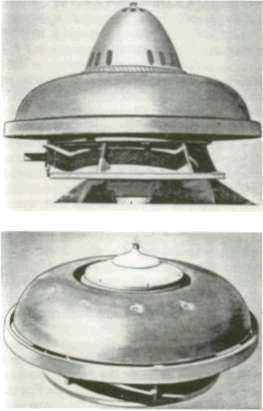 5.7 Two prototypes of Schauberger’s flying saucer, about 65 cm in diameter. Paul LaViolette, Genesis of the Cosmos: The ancient science of continuous creation, Rochester, VE: Bear and Company, 2004, p. 343; Ian Lawton and Chris Ogilvie-Herald, Giza: The truth, London: Virgin, 1999, p. 201; Lost civilizations of the Andes, davidpratt.info. Andrew Collins, Gods of Eden: Egypt’s lost legacy and the genesis of civilisation, London: Headline, 1998, pp. 58-62. Graham Hancock and Santha Faiia, Heaven’s Mirror: Quest for the lost civilization, London: Michael Joseph, 1998, p. 235. Easter Island: land of mystery, section 5, davidpratt.info. Gods of Eden, pp. 35-7, 62-3. Giza: The truth, pp. 198-210. Robert Bauval and Graham Hancock, Keeper of Genesis, London: Heinemann, 1996, pp. 28-9. Andrew Collins, ‘Baalbek, Lebanon’s sacred fortress’, andrewcollins.com/page/articles/baalbek.htm; Gods of Eden, pp. 63-4; David Hatcher Childress, Lost Cities of Atlantis, Ancient Europe & the Mediterranean, Stelle, IL: Adventures Unlimited Press, 1996, pp. 31-6, 48-50; Christian and Barbara Joy O’Brien, The Shining Ones, Kemble, Cirencester: Dianthus Publishing, 2001, pp. 265-82; Graham Hancock, Magicians of the Gods: The forgotten wisdom of earth’s lost civilisation, London: Coronet, 2015, pp. 249-87. The Shining Ones, p. 269. Collins, Gods of Eden, pp. 66-72. H.P. Blavatsky, The Secret Doctrine, Pasadena, CA: Theosophical University Press, 1977 (1888), 1:554-66. Theo Paijmans, Free Energy Pioneer: John Worrell Keely, Lilburn, GA: IllumiNet Press, 1998, pp. 58, 144, 200, 207-12; Clara Bloomfield Moore, Keely and his Discoveries: Aerial navigation, London: Kegan Paul, Trench, Trübner & Co., 1893, Mokelumne Hill, CA: Health Research, 1971, pp. 106, 122-3; Dale Pond, Universal Laws Never Before Revealed: Keely’s secrets, Santa Fe, NM: Message Company, 1996, pp. 54-60, 214-17, 232-4, 257 (svpvril.com); Dan A. Davidson, Energy: Breakthroughs to new free energy devices, Greenville, TE: RIVAS, 1990, pp. 12-13. Christopher Dunn, The Giza Power Plant: Technologies of ancient Egypt, Santa Fe, NM: Bear & Co, 1988, pp. 109-19; Frank Joseph, ‘Mysteries of Coral Castle’, Fate, 1998, parascope.com/en/articles/coralCastle.htm; Kathy Doore, ‘The enigma of Coral Castle: a geomantic wonder’, labyrinthina.com/coral.htm. Callum Coats, Living Energies: An exposition of concepts related to the theories of Viktor Schauberger, Bath: Gateway Books, 1996; Olaf Alexandersson, Living Water: Viktor Schauberger and the secrets of natural energy, Bath: Gateway Books, 1996; John Davidson, The Secret of the Creative Vacuum, Saffron Walden, Essex: Daniel Company, 1989, pp. 246-62; Nick Cook, The Hunt for Zero Point, London: Arrow, 2002, pp. 296-328; schauberger.co.uk. There are reports of over 200 Christian saints levitating – usually involuntarily – during religious raptures, and some cases are supported by an impressive amount of eyewitness testimony.1 For instance, the 16th-century mystic St Teresa of Avila was observed on many occasions, typically when deep in prayer, to rise anywhere from a few feet to as high as the ceiling of the room. When she felt an ‘attack’ coming on she would beg the sisters in her convent to hold her down, though they were not always successful. Once while receiving Holy Communion from the Bishop of Avila, she felt her knees begin to leave the floor so she clutched onto the grille. But after receiving the sacrament, she let go and rose into the air. The 17th-century Franciscan monk St Joseph of Copertino began levitating during services and was often observed by whole congregations. Once while walking in the monastery grounds, he soared up into the branches of an olive tree and remained kneeling on a branch for half an hour, the thin stem hardly moving under his weight. Unable to glide down, after his ecstasy had passed, he had to wait for a ladder to be brought. For 35 years he was banned from all public services, but he levitated not only before the Pope and his fellow monks but also before Europe’s titled heads and the philosopher Leibnitz. The Spanish ambassador to the papal court watched him fly over the heads of a crowd to a statue of the Virgin Mary, where he briefly hovered. After giving his customary shriek, he flew back; the ambassador’s wife had to be revived with smelling salts. The duke of Brunswick hid himself in a stairway to observe one of Joseph’s levitations. After observing a second levitation, the duke renounced his Lutheran faith and became a Catholic. At Osimo, Joseph flew eight feet into the air to kiss a statue of Jesus then carried it off to his cell and floated about with it. He is also reported to have caught up another friar and carried him in the air around the room. In the 1920s Brazilian medium Carlos Mirabelli performed stunning phenomena under test conditions. Full-form materializations of deceased individuals known to the witnesses appeared, who were able to converse with the investigators, and to touch and be touched. He was also able to levitate and remain floating for minutes at a time. In one instance, a chair with Mirabelli in it rose into the air until it was two metres above the floor, where it remained for two minutes.6 Levitations of mediums have frequently been reported since then in spiritualist journals but, as far as is known, no medium has been able to produce them in fraud-proof conditions. A similar display was reported by American journalist John Keel. While travelling in Sikkim in the 1950s, he met an old lama who demonstrated his ability to levitate. He ... pressed one hand on top of his stick, a heavy branch about four feet long, frowned a little with effort, and then slowly lifted his legs up off the floor until he was sitting cross-legged in the air! There was nothing behind him or under him. His sole support was his stick, which he seemed to use to keep his balance. I was astounded. And now the incomprehensible happened ... [S]lowly the whole tense body of this man elevated itself about eighteen inches off the floor and remained there, floating in the air with the toes pointing down. Tibetans speak of a power of fast-walking known as lung-gom. An eye-witness account was provided by Alexandra David-Neel, an early 20th-century explorer, journalist and Buddhist. While in northern Tibet, she saw a man approaching with an ‘unusual gait’ and ‘extraordinary swiftness’. Fig. 6.1 Indian yogi Subbayah Pullavar. 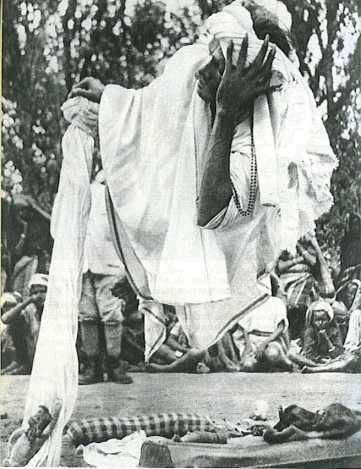 In 1984 a German film crew filmed the levitation of an African witch-doctor, Nana Owaka, in Togo. After meditating for a full day, he placed dry leaves and twigs in a circle and sat in the middle. Just as the sun was setting, Owaka started to stir. A villager lit the circle of twigs and flames shot up. Drums began beating wildly – then we were hardly able to believe our eyes as Owaka stood and rose straight upward! It was as if he were being lifted on a pillow of air. He simply hung as if suspended, with nothing above or below him. Rodney Charles and Anna Jordan, Lighter than Air: Miracles of human flight from Christian saints to native American spirits, Fairfield, IO: Sunstar Publishing, 1995, pp. 155-80; Stuart Gordon, The Paranormal: An illustrated encyclopedia, London: Headline, 1992, p. 395; Brian Inglis, The Paranormal: An encyclopedia of psychic phenomena, London: Paladin, 1985, pp. 159-60; Richard S. Broughton, Parapsychology: The controversial science, New York: Ballantine Books, 1991, pp. 52-3. William Crookes, Researches in the Phenomena of Spiritualism, London: J. Burns, 1874, Pomeroy, WA: Health Research, n.d., pp. 9-19, 21-43, 88-91; H.P. Blavatsky, Isis Unveiled, Pasadena, CA: Theosophical University Press, 1972 (1877), 1:202-4, 358-9. Researches in the Phenomena of Spiritualism, pp. 89-90; Gordon, The Paranormal, pp. 395-6; Inglis, The Paranormal, p. 161. Inglis, The Paranormal, pp. 161-2. Brian Inglis, Natural and Supernatural: A history of the paranormal, Bridport, Dorset: Prism Press, Lindfield, NSW: Unity Press, 1992, p. 425. Brian Inglis, Science and Parascience: A history of the paranormal, 1914-1939, London: Hodder and Stoughton, 1984, p. 224; Stephen E. Braude, ‘Survival or super-psi?’, plus reply by Ian Stevenson, Journal of Scientific Exploration, 6:2, 1992, pp. 127-44, www.scientificexploration.org. Rosemary Ellen Guiley, The Encyclopedia of Ghosts and Spirits, New York: Checkmark Books, 2nd ed., 2000, p. 221. Louis Jacolliot, Occult Science in India and Among the Ancients, NY: University Books, 1971, p. 257. Lighter than Air, pp. 64-5. Alexandra David-Neel, With Mystics and Magicians in Tibet, London: Penguin Books, 1937, p. 186. Lighter than Air, pp. 98-9. Gordon, The Paranormal, pp. 358/9. D. Hatcher Childress (ed. ), The Anti-Gravity Handbook, Kempton, IL: Adventures Unlimited Press, 1993, p. 171. UFOs: the psychic dimension, section 6, davidpratt.info. As mentioned in section 1, Kepler believed that the rotation of the sun generated its gravitational force. A disciple of Pythagoras and Plato, he believed in an ether of subtler matter and that stars and planets were animated by souls. He took the view that it was solar magnetism that held the planets in their orbits, and he conceived magnetism to be a form of vortical motion. More recent theosophical writers such as H.P. Blavatsky, W.Q. Judge and G. de Purucker have also highlighted the link between gravity and electromagnetism, the bipolar nature of gravity, and the etheric origin of force, as the following quotations show. *The theory that gravity is caused by bombardment of material objects with tiny particles (see section 3). H.P. Blavatsky, The Secret Doctrine, Pasadena, CA: Theosophical University Press (TUP), 1977 (1888), 1:508. H.P. Blavatsky, Isis Unveiled, TUP, 1972 (1877), 1:271. H.P. Blavatsky Collected Writings, Wheaton, IL: Theosophical Publishing House, 1950-91, 5:152-3. William Q. Judge, Echoes of the Orient, San Diego, CA: Point Loma Publications, 1975, 1:336. W.Q. Judge, The Ocean of Theosophy, TUP, 1973 (1893), p. 154. G. de Purucker, The Esoteric Tradition, TUP, 2nd ed., 1940, p. 860. Ibid., 2nd ed., p. 445. Ibid., 3rd ed., 2011, p. 466. Ibid., 2nd ed., p. 861fn. The Secret Doctrine, 1:159, 2:68fn, 250, 308fn; The Esoteric Tradition, 2nd ed., pp. 324-7, 453-4, 760; G. de Purucker, Studies in Occult Philosophy, TUP, 1945, pp. 450-1; A.T. Barker (comp. ), The Mahatma Letters to A.P. Sinnett, TUP, 2nd ed., 1926, pp. 98-9.